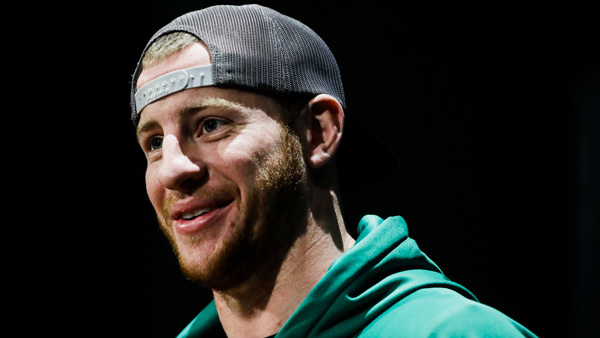 Philadelphia Eagles quarterback Carson Wentz appears to be making some significant strides in his comeback from a torn ACL and LCL. The quarterback posted video of himself throwing inside the team's practice facility Monday. Wentz has established the season opener as his target return date. It's still too far out to know whether he'll be able to achieve that goal, but it's clear that he's come a long way since injuring his left knee in December against the Los Angeles Rams. He went from using crutches to a cane to walking on his own, and now, the video shows, is able to drop back, plant and throw, albeit with a large brace around that left knee. Recovery from an ACL tear usually takes around 9-to-12 months. The Eagles intend to take the long view when it comes to Wentz's injury and don't want to rush him back. If he's not ready, they currently have Super Bowl MVP Nick Foles on the roster. They have set the trade price for Foles high, knowing the value of having a top-end insurance plan, particularly with their franchise quarterback still on the mend. Wentz, though, is pushing his way back. His recovery will be the dominant story in Philadelphia over the spring and summer.